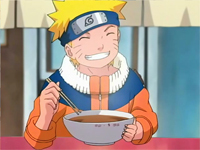 This is Naruto's favourite food, Ramen is a noodle dish that was originally imported to Japan from China. Over the last few decades, however, ramen has become a typical Japanese dish and gained great popularity inside and outside of Japan. 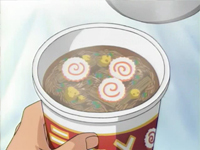 Ramen noodles are about as thin as spaghetti and are served in a soup with various toppings.